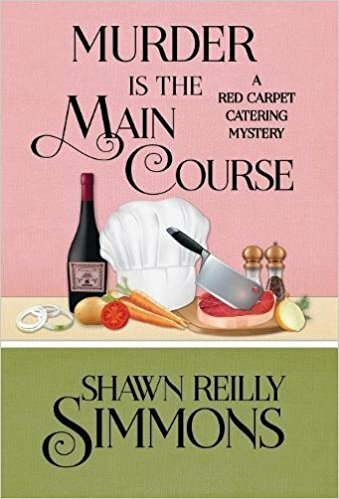 Details at the end of this post on how to enter to win a copy of Murder is the Main Course, and a link to purchase it from Amazon, and an indie bookstore where a portion of the sale goes to help support KRL. Professional caterer Penelope Sutherland is definitely out of her comfort zone working on a movie set in Forrestville, Indiana. Red Carpet Catering normally provides cuisine for celebrity events and movie crews in New York, but in order to have more creative freedom and save money, director Jennifer Carr is filming a new “The Turn of the Screw” in the Midwest town. Penelope finds herself taking on far more work than she expected when she discovers one of the producers, up-and-coming Chef Jordan Foster, hanging in his restaurant freezer. Not only is Penelope tasked with providing meals for the remaining cast and crew, she has been begged by the widow to fill in as Festa’s head chef. Jennifer, a friend of Jordan’s from high school, refuses to believe that he would have committed suicide despite the sheriff’s quick conclusion, and evidence soon proves her correct. Penelope has her own questions, and she can’t shake off the unsettling vibe she is feeling from both the movie cast and the local residents. Penelope’s best friend Arlena Madison is the lead actress for the movie, but reality star Max Adison and their movie star father are venturing off on a role-researching glamping trip. Also away is Penelope’s New Jersey Homicide Detective boyfriend Joey Baglioni, although that is a bit of a relief since he just proposed taking their relationship to another level. Penelope truly feels on her own in the off-kiltered Indiana town, where teens go missing, Festa is vandalized by vegetarians, and an unsettling young man linked to Satanism camps out in the woods. The restaurant staff has its own odd vibe, with a surly waitress who barely pretends to respect any authority and stock seeming to disappear without anyone caring. Readers will feel just as unsettled as Penelope by Forrestville’s insularity and seeming disregard for the serious crimes. The normal eccentricities of a film set, from a stage mom to the Madison aura of celebrity, are a welcome relief providing humor and levity. Penelope emerges as one of the sharpest investigative minds in town, refusing to accept the local sheriff’s complacent attitude towards his neighbors. Details surrounding catering and restaurant operations play out in the background as Penelope returns to her professional duties, but her reliable staff realistically enables her to delve into uncovering dire criminal acts. Multiple crimes will be detected and solved by the time Penelope and her catering company leave town, and readers will be looking forward to her gourmet events and investigations of the famous and elite. To enter to win a copy of Murder is the Main Course, simply email KRL at krlcontests@gmail[dot]com by replacing the [dot] with a period, and with the subject line “course,” or comment on this article. A winner will be chosen June 17, 2017. U.S. residents only. If entering via email please include your mailing address, and if via comment please include your email address. Oh this sounds so good!!!! Thanks for the chance to win a free copy of Murder Is The Main Course. I love foodie cozies. I’ll have to check this one out. A recent post from Brooke Bumgardner: Want to Work at Home? I have been wanting to read this. Thank you for the chance. I’m not familiar with this author or series but it sounds interesting! Thanks. I cannot believe how many mysteries are out there. this is another unusual sounding one i’d like to win. I have not had the opportunity to read this author yet. The review has piqued my interest. This is an intriguing premise for a mystery series. Great review, too! aut1063(at)gmail(dot)com. Sounds like a fun series.Thanks for the giveaway! Another new author to me . Really looking forward to reading.